Note: This is a graphics-intensive page. Please be patient, while the page is loading. Since Kamal Hasan was pretty busy with his ambitious project "Marudanayagam", there were no Kamal movies released last year. Especially during last Deepavali his fans missed his films so much they decided not to celebrate the festival but observe it as a black day. They approached Kamal and demanded that he should give them a movie or two before completing "Marudanayagam". Now with "Marudanyagam" placed at the back burner, Kamal is all set to make his fans happy with a quickie called "Hey Ram". Maybe something to do with his quest to explore Indian history... even "Hey Ram" deals with the historic days of India during 1947-48. Interestingly the title of the film "Hey Ram" refer to the last words of Mahatma Gandhi uttered by him while he was assassinated in 1948. "Hey Ram" would be a bilingual produced simultaneously both in Tamil and Hindi with Sharukh Khan and Rani Mukharjee in lead roles with Kamal being the other hero. Boolywoods ex-dream-girl Hama Malini does an important role in the movie, while popular character actor from Bollywood Nassurudin Sha is expected to perform Gandhis part in the film. Vaali a well-known Tamil lyrist is also part of its star cast. Though this news item is yet to be confirmed, there are rumors that the popular violinist L. Subramaniam may be approached for its music. Kamal himself writes lyrics for one of its songs in Tamil, sung by Hariharan and Kavita Krishnamoorthy. Being a movie with historic theme, it would have been difficult for anyone to gather the historic facts for "Hey Ram". But fortunately for Kamal, most of the supporting information for the story is already gathered, while he was making his research on "Marudanayagam" itself. Besides according to Kamal the related documents for the movie is safe and still available, as we are not that far away from its period. The works on "Hey Ram" would start on March 22 and the movie is expected to be ready for release, well before the end of this year. According to some sources, the relationship between the two former Kollywood queens Meena and Roja is strained now. Roja particularly is extremely upset with Meena, because she believes that the later has literally grabbed her role in "Periyanna" opposite Vijayakanth. Though Roja was initially considered for "Periyanaa", Meena is said to have influenced the producer with her reduced price and got into the movie with a wonderful role. Peryiyanna also has beautiful Manasa as its second heroine paired opposite Surya. Manasa who is none other than the younger sister of Easwari Roa, interestingly has several transformations of names to her credit. Her original name was Ganga and when Parthiban chose her for his jinxed film "Kaakkai Chiraginile", he changed her name as Thanuja. Now when S.A. Chandrasekar decided to have her in "Periyanna", she is re-christened as Manasa. ", itself was the remake of the successful Tamil movie "Kaadalukku Mariydai". But unfortunately it was a miserable flop in the Hindi box-office.
" and "Jodi" but with its lyrics in Tamil different from that of "Jodi". initially the producer wanted to cast Aishwarya opposite Prasanth. But since the ex-miss-worlds asking rate was way out of this world, he just requested her to do a guest role for a nominal price and the Champaign-eyed Aishwarya too complied with his request. National award winning director Agathian is back into the rumor mill again, Earlier there were reports about his third marriage with a girl much younger to him. And now they say he often talks with the ghost of late Silk Simita. It is reported that he once mentioned his friend Bharathi Raja that whenever he has any decision to make he always approaches the ghost to help him make the right decision. if it is an advice from Silk Simita, Agathian must be happy that he has found a true spiritual guide. Work on Rajini's forthcoming entertainer "Padiyappa" is complete now. To mark its completion, Rajni broke a ripe pumpkin, a ritual that is traditionally performed to ward off evil. The movie has come out well and Rajini is pleased with the final product. Normally on an average Tamil movies have a length of 14 reels. But "Padiyappa" is exceptionally long with whopping 18 reels. 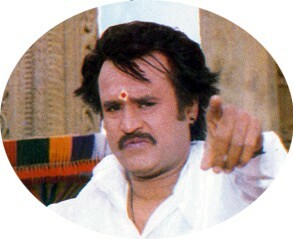 So there are talks in the "Padaiyappa" camp that Rajini considers releasing the movie with two intervals. Like other Rajini movies "Padiayppa" too is hot among its distributors. With its current sale of twenty crores of Indian Rupees, "Padiyappa" surpasses the earlier record of twelve crores set by "Arunachalam", the previous Rajni-starrer. With a juggernaut like "Padiyappa" on its way, many movie producers have dicided either to release their movies well before "Padiyappa" or hold them back till it is safe to release after "Padiyappa". The recent slew of releases like Prabhu Deva's Ninaivu Irukkum Varai, Vijay's Thullatha manamum thullum, Ajith's Unnaythedi, etc. are said to have arrived early because their producers do not want a head-on collision with "Padiyappa". On hearing about "Padiyappa", While others run helter-skelter, there is this brave director T. Rajendran who is all set to take "Padiyappa" in his stride. This arguably controversial director has set his mega-venture "Monisha en Monalisha" too for this Tamil New Year in April. When questioned about his precarious stance, Rajender maintains that he has always thrived from stiff competition. For instance he released his "Uyirulla Varai Usha" when Rajni's "Thudikkum Karangal" was out. His "Thangaikor Geetham" and Rajni's "Thanga Magan" were released at the same time. Later his "Maithili En Kathali" too wrestled with Rajni's "Kaikoddukum Kai". Interestingly in all those three movies of T. Rajender were undeniable hits in the box-office. Now with its glamour girls Mumtaj and Sneha already making waves, let us hope "Monisha En Monalisa" too becomes another success for TR. Last week everyone got worried about an accident Prasanth had during the making of his movie "Poomagal Oorvalam". It was reported that the actor was badly hurt on his face, while he took part in a stunt scene. But now they say the whole incident actually did not take place at all. The accident drama is just a publicity stunt to give Prasanth an action-hero image. When asked about his injury, Prasanth coolly replied that he had very minor cut on his face, while he was doing his regular workouts. According to him the press is responsible for blowing up the incident out of proportions. While the entire din about Prasanth's injury is slowly subsiding, Prasanth is already into another controversy. This time a young girl who is crazy about the actor, gave Prasanth an ultimatum that if he did not marry her she would kill Prasanth. To top it all, the lunatic fan cut a goat's head and throw it on Prasanth's door steps. Provoked by this ghastly incident Prasanth's family has reported this incident to Police and they have already nabbed the girl. However Prasanth's family is still worried about the goat's head, which is reported to be associated with evil spells of black magic. Though the whole incident sounds rather spooky and grisly, one wonders even this episode too is part of their on-going publicity campaign! the same people who share the success of "Pooveli". However when it comes to heroines, they have decided to go with Isha Khopikar instead of Kausalya or Heera. Isha who is extremely popular after her "Kaadal Kavithai" and "En Swasa Kaatre" is paired opposite Karthik for the first time . Recently Ajeet Kumar had multiple operations on his spine to treat his backache that he inherited from his motor-cycle racing days. While the actor was ailing, there were several rumors that Ajeet won't walk anymore and his career is doomed. But the determined Ajeet has remarkably recovered from his set back to prove all his detractors wrong and he is back to his normal shooting schedule now. Earlier the actor recklessly accepted every movie that came on his way. He used to work simultaneously on several movies with worthless stories and saw most of them fail terribly in the box-office. But recently Ajeet has wised up and he is choosier about his projects. These days he insists on movies with solid themes. If the plot of a movie is good, he does not even bother about his remuneration. For example, currently Ajeet does a movie called "Amarkalam" totally free for its producer. According to the Bollywood media, Aishwarya Rai's career is in a very bad shape. She is termed as a cold fish and a non-actress with most of her films in Boolywood failing miserably. Her earlier Hindi ventures both "Aur Pyar Ho Gaya" and "Jeans" being disastrous in the box-office, Aishwarya Rai got the maximum flak and people started writing her off. When questioned about her predicament, Aishwarya says that filmmaking is a team effort and if her movies flop it is not fair for anyone to attribute the entire failure to a newcomer like her. Among her flops she is extremely proud of "Iruvar", which according to her is nothing short of a classic and she is indebted to Mani Ratnam for giving her that opportunity. As for "Aur Pyar Ho Gaya", she thinks that it proved everyone that she had all it takes to become a heroine. Though Jeans was a washout in Hindi, she found it reassuring that it was a super-hit in its principal languages - Tamil and Telugu. After a row flops in Bollywood, finally Aishwarya enjoys success with her recent release "Aa ab Laut Chalen", home production of veteran Rishi Kapur with the hunk Akshaye Khanna in its lead. If that calls for celebration, the pretty girl is even more thrilled with her two new assignments "Jodi" a Prasnth-Aishwarya starrer and "Kandukonden Kandukonden" a Rajeev Menon's film in which she is paired opposite Abbas. still an amazing 50 lakhs. Looks like this new strategy is working well and hopefully she would be more affordable to many more producers in Tamil.